Launch party was at Ace Hotel Cleaners last night. And this year, the stakes are higher than ever. As announced by Holt last night, the winner of the Bike Design Project will see their creation turned into a full-fledged production model manufactured by Fuji Bikes. The company has committed to make 100 bikes and the winning model (after it’s been value-engineered to a lower price-point than a one-off, custom bike) will be available in select bike shops in 2015. 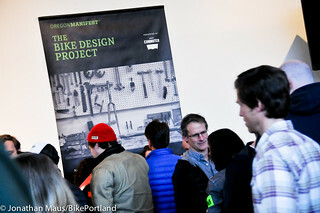 Since its inception in 2008, the goal of the Oregon Manifest has been to push the limits of what a city bike can do. A bike that would not only work well for urban and utility riding, but more importantly, a bike that would inspire the masses to ride. The ultimate dream of organizers was that this mix of design and inspiration would be a catalyst for a new bike that would take the country by storm. But so far, that dream has not been realized. Yes, there have been successes and the event has definitely touched a nerve among bike fans and industry insiders, but so far it hasn’t spawned that One Big Idea that garners widespread, mainstream attention. This year could change all that. 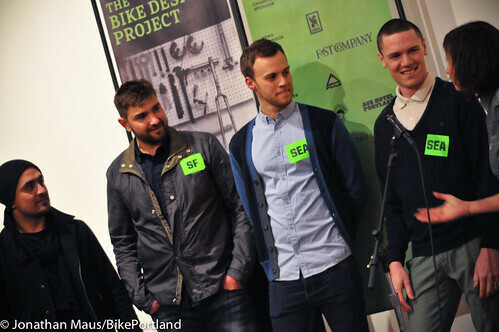 Left to right: Oved Valadez, Industry (Portland); Chris Harsacky, Huge Design (San Francisco); Oliver Mueller, Teague (Seattle); Taylor Sizemore, Sizemore Cycles (Seattle). The design firms are full of young, up-and-coming stars with impressive projects under their belts. Paired with experienced bike builders, they’ll have until July 25th to finish their designs (they started work in December). On that date, Oregon Manifest will host parties in each of the five cities and public, online voting will begin three days later. The winner will be announced August 4th. Each team will work from the same design criteria that comes with several mandatory features each bike must include: an anti-theft system, lighting, fenders, load-carrying capacity, ability to stand freely, and it must be road worthy. Unlike the 2011 event, there will be no large-scale race event to test the bikes. Instead, each team must submit a video of their bike in action and in real-world scenarios. 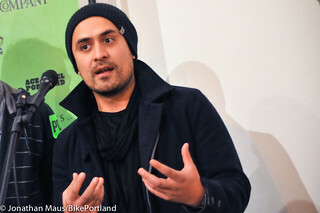 As to what type of innovations might come out of this contest, Oved Valadez, a designer with Portland-based Industry said his team will be looking for a “category busting” idea. To do that, he says they will step back and ask questions. “What prevents people from riding? Is it the tech, the fear, the fashion?”. Valadez said design firms specialize in asking the right questions, a much-needed skill in creating a groundbreaking product. And it’s one that bike makers don’t always have. And hopefully, the winning bike will be wanted by the public. With the promise of production, the teams in this year’s Bike Design Project have much more than civic pride and bragging rights on the line, they’ve got a shot at a lasting legacy. And who knows, maybe one of them will create the next Sting Ray. I have to believe that there are quite a few disappointed bike builders this morning and I count myself as one of them. What bugs me is not necessarily the design firm/craftsman collaboration, which created some very interesting and groundbreaking designs at the last OM, but the fact that it’s an invitation only, closed competition. No school teams, no solo craftspeople. What made OM such fun was having a wide range of experiences and talents brought to bear on what constitutes a utility bicycle. That seems to have been thrown out in favor of a safe and approachable corporate model. A total sell out in other words. Only 5 teams? This makes the event much less interesting. There will certainly be less total creativity on display. I didn’t like the emphasis on design for the sake of design at the last OM and the next event only goes farther down that path. The French Constructeur Trials of the 1930s and 40s were about improving function. It’s a shame that OM has lost sight of that and has decided to marginalize itself this way. I couldn’t agree more, Michael. Certainly the pre-ordained collaborative efforts could happen alongside the open-invitation efforts of smaller/lesser known builders. It’s a serious bummer that Manifest has shifted from being a break-out opportunity to “let’s rely on established builders and give even more publicity & opportunity those who already have the hip designery jobs.” Using the term “sell-out” can be a cliche, but in this instance I think it’s wholly appropriate. I went from excited to sad as I read this. I loved watching all that took place in the past events and was truly looking forward to building a design and seeing things from the competitors point of view. I suppose that will never happen. Perhaps this is an opportunity to set up a parallel event focusing on the elements now missing from the evolving OC event. If the goal of the Manifest this year is to get people who don’t regularly bike to ride, then the judging should reflect that. Get some members from outside the usual bike community to be judges, or even to be riders in the Constructor’s Challenge! I think even the ride has been jettisoned, in part due to the ‘Five Cities/Five Teams’ configuration……. Matt, I totally agree. I never thought of the OM as something that would create an object that would get everybody cycling. To me it was never about that. It was all about the love of the bicycle, about it’s physical manifestation. It’s about the obsession of detail and the beauty of execution which is precisely why the organizers of OM have got it all wrong. They will never incubate a product that “will take the country by storm” because we all know it’s not about the bike but the environment in which we ride. Look at Holland: an example of a cycling nirvana and everyone rides the same bike and doesn’t give it a moments thought. That doesn’t negate what OM represents which is engagement and participation in creating an object of beauty and obsession….. I think the Holland comparison has limits. We have a very different culture here. Love it or hate it, it’s the truth. 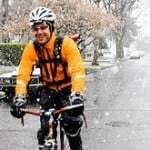 The object, the product, the bike must be compelling as an object for many Americans to consider using one. To continue on the Holland analogy… Their bike network is complete like our auto network is complete… So why aren’t we all driving around boring black cars that all look the same and not giving it a moment’s thought? 😉 And look at how much design emphasis we put into our cars. Automakers spend billions every year obsessing over designs to create excitement so that people MUST have a new one or two or three. This being said, I agree that nice bike designs are a poor substitute for having nice places to ride them. I think we can have both in the future. I can understand people’s concerns about the event. But I’m going to wait and see what ends up happening. The people behind this thing are not trying to make a bunch of money, I think they truly want something special to come out of this… And thus the tweaking of the format. My impression was that the design firms involved are very talented and the teams are all very engaged and committed to the process. In other words, we have top-shelf designers teamed with top-shelf builders and they’ve been given a format and a goal that should be highly motivating. As for whether bike design matters, I absolutely think it does. Is bad design/bad bikes the #1 reason so few Americans ride? Probably not. 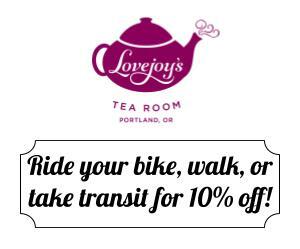 But I do know that the lack of a super cool and functional and accessible bike certainly has a negative impact on ridership. What ends up happening could be cool, but it won’t fix what is wrong right now. Manifest has become an insular who-you-know event. I saw/heard no outreach and as a budding builder who was interested in participating, this is a real bummer. This was the exciting grass roots thing and now it’s pretty much out of reach. I’ve no doubt we will some impressive designs. I’m just bummed none of them will mine……. Most people don’t ride because they are afraid to. A bike design won’t change that infrastructure and education will. That said I am always jazzed when creatives take on a challenge with such lofty goals…especially when it involves making bikes. so how’d they pick the teams? was there some sort of prequalifying round? 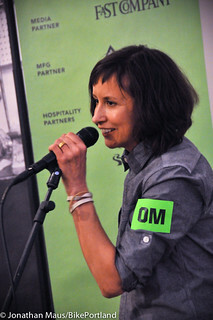 I volunteered at the first event, and could already see that, if future OM’s were to happen, they would probably go down a road rather like this one — increasingly niche, even clique-ish in some aspects, and now, ultimately, a closed circle — all in the interests of pursuing a very particular vision. This is not a public-private partnership, but a privately owned brand and they can do what they please. And so can I. I’ll be skipping this year’s OM, and may even try to get some friends together to stage an alternate bike event that showcases the most innovative HOMEMADE answers to the same critera. If you’re interested in creating this with me, contact me off-blog. When I hear “design” with regards to bicycles I think of Function being compromised in order to achieve Form, the result being something that just doesn’t work well but sure looks cool. Designers seem to know nothing about bicycling and rarely respect that the modern bike as evolved to it’s current state for a lot of reasons. Making something different just for the sake of making something different is fraught with dead ends and dinosaurs. I hope that an alternate event does take place. Mrs Dibbly & I will enthusiastically attend. We attended both previous OM events. We might attend this one out of curiosity, but my expectations have been lowered. One thing that I should also say is that I do applaud Fuji for taking a risk. 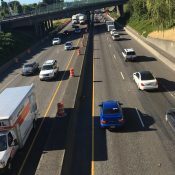 How can they call it “Oregon Manifest” if the only connection to Oregon is a single team? If the sought-after “masses” young, white, fit men, we’re in good hands. I’m sure these folks are all incredibly talented. But are these the “fresh voices” our male-dominanted bicycle industry needs? Wow. First I was excited after reading about the event, the design criteria, and Fuji’s promise to commercialize the winner. But it took Michael’s comment to make me focus on the fact that this was a closed competition. I enjoyed the first OM immensely. I saw some really cool, creative, inventive, mostly functional ideas. And a lot of the enjoyment of that was the sheer range of ideas (including Michael’s bike, BTW) triggered by the wide-open competition. Maybe this year’s tightened design criteria would have reined in the range of entries slightly, and maybe that would have been OK. 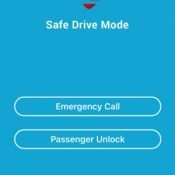 Mandatory integration of necessities generally sold as “accessories” is probably a good one – most people expect locking systems and lights to be integrated into their cars after all. What’s not OK with me is closing the competition off to all but 5 teams, even if those teams consist of handpicked, seasoned professionals. I’m afraid I won’t be able to resist attending OM despite this, but I certainly will also eagerly welcome (and attend) an alternative event. eh, i can see where they’re going with this, as the display of cool bikes does not really forward the movement in relation to possible jobs and a real retail impact in the bike industry. If we’re all just making candy frames and patting each other on the back, then the industry doesn’t really move forward. I get that, and hope that the Portland design wins. THAT SAID, with the loss of the handmade bike show after a couple years of hosting, and the reformatting of OM, I think this city is starving for an opportunity to just meander around a bunch of really sick bikes, maybe pick up some stickers, think about a candidate for a new frame, drool, take pictures, bring a kid, that type of thing. The perception here is that frame builders may not see an ROI to showing me and my kid one of their bikes because I won’t be buying one, so they are moving towards events that get them industry visibility, and more importantly, orders. Like some of the wineries who open their doors to the masses once a year so you can take a few sips, but really, they are looking for Fred Meyer and restaurant contracts. It would be cool, if an outsider frame maker, would make a bike without an “invitation”, but the community is so close knit, I doubt it happening. I thought it was a bit exclusive (invite only, etc). . . . .
Then I saw the venue and the number of people on Thursday night. Small (tiny) venue and large numbers of people. I, for one have claustrophobia. If it’s at The Cleaners… You’re not invited.